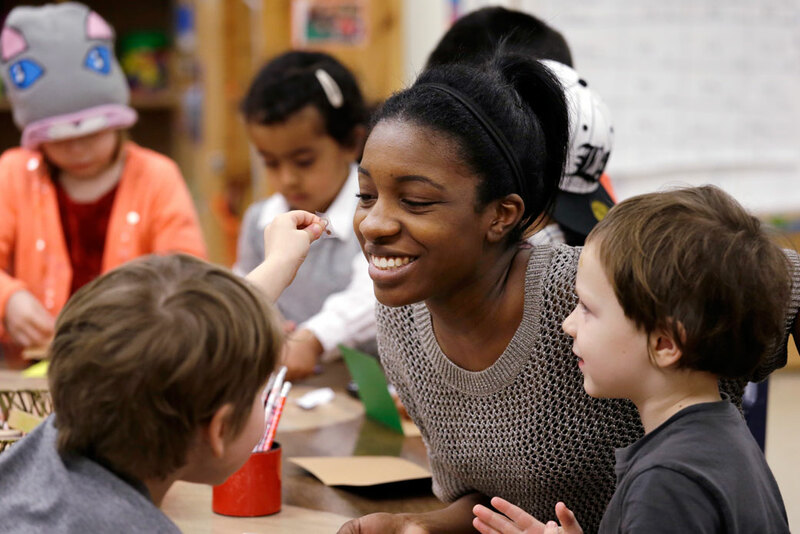 Assistant teacher D'onna Hartman works with children at the Creative Kids Learning Center in Seattle on February 12, 2016. Teachers need better support and training as they enter the profession so that they are ready to serve their students; here’s how to ensure they get it. When a new doctor first enters the profession, she is not immediately handed the scalpel. When a lawyer graduates from law school, he is not immediately expected to try significant cases, especially without support from a team. And yet when teachers are first handed the keys to their classrooms, they are each suddenly responsible for the futures of dozens of students. These new teachers rarely receive the necessary training or guidance to ensure that their first months, or even years, on the job are positive and productive. To ensure that all teachers have the opportunity to excel from day one, prospective and new teachers should have the opportunity to learn from mentor teachers, practice essential teaching skills, and gradually improve their practice. Programs that support gradual entry into the teaching profession—including extended clinical preparation, residencies, and induction programs—provide this opportunity. Through these programs, prospective and new teachers spend more time working alongside experienced teachers, observing strong instruction and management, and receiving valuable feedback. This allows them to slowly gain more responsibility to plan and lead lessons. Often, these new teachers also participate in advanced coursework to better understand the underlying philosophies that shape excellent teaching as they begin their practice. It matters little if teachers participate in supported entry programs during or after graduation from a preparation program. However, it is critical that all teachers—both prospective and new—have access to experiences that allow them to practice critical teaching skills and learn from expert teachers with proven track records of success. Whether such programs are run by traditional teacher preparation programs, districts, or alternative certification providers, they have great potential to transform teachers’ entry into the teaching profession. This report explores the challenges facing inexperienced teachers’ entry into teaching, highlights some of the early outcomes of model programs, and proposes an expansion of supported entry programs for prospective and new teachers. In March 2014, a group of teachers and doctors met on Capitol Hill to determine what the teaching profession could learn from the medical field. As in medicine, teaching is not a profession that should be learned in the hot seat. Teachers are responsible for ensuring that the next generation of Americans are ready to lead, so teaching is not a job that should be undertaken lightly. The medical profession does not train doctors by forcing new practitioners to complete their first surgery with no guidance, nor should the teaching profession train teachers by putting them in charge of 25 students without giving them significant classroom experience. A supported entry experience would allow prospective and new teachers to observe educators with a diverse array of skills and who teach a variety of subjects and grade levels, much like the rotations of the first year of a medical residency provide doctors insight into various specialty areas of medicine. While talent certainly plays a role in great teaching, most of us cannot learn a complex set of skills such as those required for teaching all at once. In addition to other factors that may play a role in a teacher’s success—such as a teacher’s enjoyment of teaching and motivation and inspiration to teach10—developing expertise in any field requires intense, sustained, and deliberate practice designed specifically to maximize improvement.11 This is true for professionals as diverse as elite athletes, surgeons,12 musicians, chess players, computer programmers, and scientists.13 Why wouldn’t the same hold true for teachers? Well-designed supported entry programs would overhaul the distressing experience of many teachers’ first years on the job. They would also provide new teachers the ability to build skills and habits in isolation, little by little, before they are asked to demonstrate all of their skills concurrently as a lead teacher in their own classrooms. Although there is some variation in how diverse stakeholders define the skills that are essential for new teachers, there is general consensus that educators should have excellent organizational skills; be able to plan comprehensive and thorough lessons; know how to positively manage classroom behavior; be capable of using diverse instructional strategies; and know how to check accurately for understanding and assess student learning on a daily basis.17 Teachers should have the opportunity to practice these basic skills before they are held solely responsible for student learning. Under the current system, not only do new teachers work to learn all of these skills at once, but they also rarely get feedback as to whether the teaching habits they are developing are effective. By contrast, a more gradual entry into the profession would allow prospective and new teachers to receive valuable, immediate feedback from more experienced teachers on a regular basis as they work to develop their skills. Since openness to feedback is one of the few factors that contributes to improved teaching,18 supported entry into the profession could also provide teachers-in-training with opportunities to receive feedback and integrate changes into their practice before bad habits are ingrained, as well as give the school and mentor teachers a sense of the teacher’s ability to accept and respond to feedback. Teaching is a profession of practice,22 meaning that teachers must not only have strong knowledge of pedagogy and their content area but must also know how to put this knowledge to use in a classroom setting to advance student learning. Clinical experiences and preparation—which consist of opportunities to work in a classroom with mentoring, coaching, supervision, and support from an experienced and accomplished teacher who is trained to provide effective feedback—are therefore crucial for teachers to develop their skills. Even when teachers have already had significant clinical training components, more is needed. Teaching is a skill that requires practice, training, adjustment, and refining.23 The learning curve that teachers experience during their first years in the classroom24 makes it apparent that it takes more time than teachers are currently given to achieve a level of proficiency that will help students reach higher learning levels. A more graduated entry into the profession—no matter the provider or model—would give teachers the chance to make and fix mistakes, learn from veteran teachers, and master the skills of effective teaching before being granted the enormous responsibility of molding young minds. Although some preparation programs require that students complete as many as 600 clinical training hours through student teaching, other programs—which are all low-quality alternative certification programs—report that their students did not complete any clinical training hours.25 Even the most intensive teacher preparation experiences pale in comparison with the 10,000 hours of deliberate practice that researchers say are needed to develop expertise in any given field.26 While there are isolated examples of excellent clinical residency models that provide students with ample time to practice their skills in a classroom setting,27 there is not an entire system that supports this approach. In today’s globalized, competitive economy and with the increased focus on personalized instruction and meeting the disparate needs of all students, schools and parents alike are demanding that teachers bring a much higher level of expertise and skill to the classroom. By reshaping teachers’ entry into the profession as a gradual on-ramp—complete with mentor teacher support; pedagogy and content training; and a constant, immediate feedback loop—policymakers can support teachers to meet these higher expectations earlier in their careers. There is no single, standard model for how to improve entry into the teaching profession. What a district, institution of higher education, or nonprofit organization might choose to do is influenced by funding constraints; logistical needs; and the needs of the teachers, schools, and students that the program serves. Below are some examples of common programs designed to improve the experience and skills of beginning teachers, but they are by no means the only options available for creating a more gradual on-ramp to full-time teaching. In recognition of the need for more and especially better clinical preparation, researchers are now arguing for a shift away from the typical student teaching experience as a distinct and final step in completing preparation and toward integrating clinical components into the preparation experience early and throughout the program.30 A number of programs across the country have made this shift, including by incorporating residency models into their teacher preparation programs,31 but this kind of program design is still relatively uncommon. Student learning is the primary focus of preparation. Clinical preparation is integrated throughout teacher preparation and serves as the core of the preparation curriculum. Data are used to judge candidates’ progress in the preparation program. Programs seek to develop prospective teachers’ content expertise; content pedagogy; and ability to innovate, collaborate, and problem-solve. Candidates learn and receive feedback in a collaborative professional community. Supervising teachers and clinical faculty are selected rigorously. Clinical preparation is supported at specifically selected sites that are funded to support clinical preparation. Technology is used to increase the impact of preparation—for example, to facilitate feedback or share best practices. The program develops a research and development infrastructure in collaboration with partner school districts to support continuous improvement. Partnerships must be developed with school districts, unions, policymakers, and other stakeholders in order to create successful programs. Programs that are designed in this way would lead to teachers who are much better prepared for the realities of the modern classroom because rather than just learning about it in a campus lecture, they have experienced it firsthand. Other successful programs have included additional elements such as: reduced course loads; providing a teacher’s aide;42 observations by former teachers and administrators; and even a crisis line that teachers can call to get a response within a certain time frame from experienced teachers.43 Overall, the goal is to provide beginning teachers with significant personalized support as they find their bearings in the classroom. Comprehensive induction as described above requires a significant state or district financial investment—including administrators’ time, which must be spent selecting and training mentor teachers. It also requires funding for teachers and mentors to receive extra release or planning time to meet and work together. Further, induction requires a commitment from the entire school building that time set aside for mentoring and induction is not eaten away by last minute meetings, paperwork, or other administrative duties that can fall on teachers’ shoulders. When induction programs meet a high bar for quality, they make for a much smoother transition into teaching. What’s more, by encouraging collaboration and reflection, they have the potential to transform the practice of beginning and veteran teachers alike. The support that they provide in turn helps teachers to better serve their students. Residency programs integrate clinical practice and academic content and theory. Resident teachers work alongside experienced teachers, observing strong instruction and management, receiving valuable feedback, and slowly gaining more responsibility to plan and lead lessons. At the same time, these new teachers often participate in advanced coursework to better understand the content knowledge and pedagogical skills that shape excellent teaching as they begin their practice. Teacher preparation programs often operate residency programs, but sometimes, alternative certification programs create residencies for new teachers in collaboration with school districts. Teachers can participate in residency programs after they have been hired at a participating school or during their years in a teacher preparation program. The type of residency program—whether run through a teacher preparation program, an alternative certification provider, or a school district—matters less than the quality of the program. Through yearlong residencies, resident teachers have the chance to observe all aspects of the school year. At first, the resident teacher will primarily shadow the mentor teacher. With time, the resident teacher will take on more responsibility—teaching small groups of students, executing preplanned lessons, and co-leading whole-group instruction. Meanwhile, the mentor teacher provides feedback, support, and strategies to improve the resident teacher’s practice.46 By the end of the year, resident teachers should have significant instructional and management responsibility in the classroom. Elements of all three of these existing types of programs—high-quality extended clinical preparation, induction, and residencies—can be mixed, matched, and combined to transform entry into the teaching profession. This would help the United States move from the current haphazard and chaotic system of on-the-job training to a meaningful learning experience in which excellence—rather than mere survival—is both expected and attainable, even in the earliest years of teaching. CAP believes it is possible to go even further than these existing programs currently do and create a lengthier, more gradual transition to full-time lead teaching. This would be a huge improvement not only for new teachers but also for their students. Since low-income students are disproportionately taught by inexperienced teachers,54 they are most greatly affected when new teachers are not prepared or when they burn out and leave the classroom. Conversely, low-income students benefit the most from having a skilled teacher.55 Thus, improving new teachers’ skills could be a powerful lever for reducing achievement gaps. With this in mind, programs that improve entry into the profession are gaining momentum across the country. From Boston to Los Angeles, clinically oriented preparation, residency, and induction programs are working to provide teachers with a more robust on-ramp into the profession. The benefits of induction programs extend beyond those accrued by beginning teachers and their students. Teachers who are selected as mentors also benefit from the experience. In Massachusetts, which has a statewide induction program, an explicit aim of the program is to provide opportunities to veteran teachers,68 as these teachers receive additional training; have an opportunity to grow professionally as they learn to provide guidance and feedback to adult learners; and are recognized for their excellence in the classroom by being selected for this role. While there could be any number of effective supported entry program designs, clinically oriented preparation, induction, and residency programs are all promising models for accomplishing a shared goal: to improve the skills of teachers as quickly as possible so they can provide excellent instruction to their students early in their careers. The benefits for students of having a more skilled teacher are obvious, but such programs also have benefits for teachers, whose first years can become a time for learning and mastering the skills of their profession rather than merely surviving. It is in the national interest to ensure that teachers are receiving high-quality clinical training that improves their practice. Investing in teachers early in their careers, when they are still forming habits and when they need the most support, has the potential to create lasting change in the quality of instruction that teachers provide their students. Around 172,000 new teachers are hired each year,85 but only a very small percentage have access to any kind of high-quality supported entry experience. While finding funding at the scale of medical residencies may be unfeasible in the short term, there is already public support for expanding programs that provide teachers with better preparation and supports early in their careers. According to a recent Phi Delta Kappa/Gallup poll, the majority of Americans believe that teachers should spend at least one year practicing teaching before entering classrooms of their own—44 percent of respondents said one year and 27 percent said two years.88 Only 4 percent of Americans said that teachers should spend six weeks practice teaching before assuming responsibility for their own class, a length of time far closer to the current reality for many prospective teachers. Likewise, AmeriCorps funds a number of programs that supported entry programs have accessed—as have alternative certification programs such as Teach For America—but that do not entirely fit their needs. The Education Corps is designed to provide tutoring and after-school support but not necessarily to train future teachers.92 The VISTA program matches corps members with a nonprofit organization to perform capacity building and provides yearlong stipends, but it is not intended for provision of direct services.93 The Professional Corps, which specifies teaching as one of its qualified positions, allows participants to access Segal AmeriCorps Education Awards—which recipients can use either for loan forgiveness or for paying tuition and other qualifying educational expenses—but increases residency program costs because residents are prohibited from receiving stipends through AmeriCorps and must therefore be paid through their program or the school district.94 None of these programs were designed for supported entry specifically; thus, programs dedicated to providing a gradual on-ramp to the teaching profession can sometimes find it hard to meet their definitions and requirements. Expanding access to supported entry programs should be a high priority for education policy so that teachers can meet their students’ needs as early in their careers as possible. The following paragraphs detail two possible policy options for expanding the number of prospective and new teachers who participate in successful clinical residency gradual entry programs. Policymakers should seek to expand clinically oriented preparation, teacher residencies, and induction programs, among other options, for a more gradual entry into the teaching profession and to build the evidence base for their effectiveness. To do so, CAP recommends creating a program funded through the U.S. Department of Education but administered by the Corporation for National and Community Service, or CNCS, a federal agency that typically manages volunteer service programs but has often supported education-related opportunities as well. The funding could be accessed by repurposing a small percentage of Title II funds, which can already be used for residencies; by expanding the Teacher Quality Partnership Grant Program and dedicating a specific percentage of these funds solely to such supported entry programs; or by allocating new dollars through the appropriations process. Administering the funding through CNCS would allow teacher residents to more easily access both AmeriCorps stipends and Segal education awards simultaneously. It would also allow CNCS to issue regulatory guidance that would be more tailored to the needs of programs designed to improve entry into the profession. Dedicated funding from the Department of Education would allow for the expansion of these programs without making it more difficult for other important service programs to access AmeriCorps funding. Another possible way to structure this program would be to create a competitive federal-to-district grant program to expand the number of programs that support teachers’ entry into the profession. Through this competitive program, districts would apply for federal funds to institute supported entry programs, possibly in partnership with institutions of higher education or nonprofit organizations. This funding could be configured in a variety of ways: by repurposing a percentage of Title II funds; by expanding TQP and dedicating a specific percentage of these funds solely to supported entry programs; or by allocating new dollars through the appropriations process. Aside from a small amount of funding for regulation—a set-aside of 5 percent for district administration and 2 percent for national activities—the majority of the funding would go directly to supported entry programs for training and education, mentor teachers, and teacher candidates themselves. Such programs would need to find ways to build or access the capacity needed to provide high-quality, individualized professional learning to prospective teachers, residents, or new teachers. The program should include reduced teaching schedules at full salary for both mentor teachers and those in the supported entry programs so that both parties have the time to observe, meet, discuss, and reflect on how to improve their teaching. For clinically oriented preparation programs to receive grants, they should differentiate themselves from more standard student teaching or shadowing and observation experiences by demonstrating how their students gain experience working alongside and leading a classroom for an extended period of time—at least one year. Likewise, high-quality residency and induction programs must also demonstrate how they are different from the watered-down induction and new teacher supports that districts typically provide. Costs for a program of this type could be calculated by using funding allocations for previous competitive federal-to-district grant programs and might include expenses such as release time, resident or prospective teacher stipends, and training for mentor teachers. The value of supported entry programs is twofold: Clinical training experiences will increase the number of teachers who are effective from the start; they also increase the proportion of teachers who are able to reach excellence and mastery in their early teaching years, thereby increasing the number of expert, experienced teachers in the highest-need classrooms. Like medical residencies, programs that improve prospective and beginning teachers’ skills early on could transform the experience of the first years of teaching. Rethinking teachers’ entry into the profession would offer prospective and new teachers the opportunity to learn from the best, practice teaching, and master essential skills before being handed keys to their own classrooms. If every teacher experienced a more gradual entry into the profession, they could move from sink or swim to backstroke or butterfly. Lisette Partelow is the Director of Teacher Policy at the Center for American Progress. Her previous experience includes teaching first grade in Washington, D.C.; working as a senior legislative assistant for Rep. Dave Loebsack (D-IA); and working as a legislative associate at the Alliance for Excellent Education. She has also worked at the U.S. House of Representatives Committee on Education and Labor and the American Institutes for Research. Partelow has a master’s degree in public affairs from Princeton University and a master’s degree in elementary education from George Mason University. She received a bachelor’s degree from Connecticut College. Annette Konoske-Graf is a Policy Analyst with the K-12 Education team at the Center. After studying political science and Spanish literature at the University of California, Berkeley, she moved to Miami, Florida, where she taught 9th- and 10th-grade literature in Little Haiti. She was one of seven district finalists and runner-up for the 2012 Francisco R. Walker Rookie Teacher of the Year Award and the winner from the Education Transformation Office Region of Miami-Dade County. The Education Transformation Office serves the 27 high-needs schools within the district. Konoske-Graf graduated from Columbia University’s Graduate School of Journalism in May 2014 and from Columbia’s School of International and Public Affairs, or SIPA, in May 2015. Upon graduation from SIPA, she won the Raphael Smith Memorial Prize for her essay on a taxi ride in southern Chile. Konoske-Graf is a barefooted Southern California native who loves writing, teaching, and scuba diving.